A billboard calling attention to homophobia and anti-gay bigotry in the Anglican Church has been vandalized, says a gay-friendly church in Auckland, NZ. St. Matthews-in-the-City had put up a large billboard with a cross pointing to varying levels of gayness – it’s effectively a giant Gay-Dar meter with a religious cross as the marker. 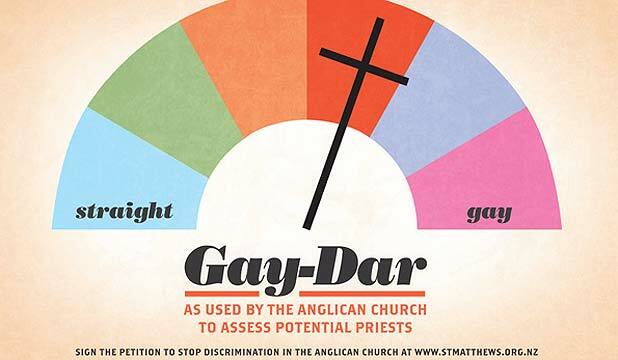 The meter shows “Straight” on one side and “Gay” on the other, with the caption: “As used by the Anglican Church to Asses Potential Priests.” The billboard is intended to spark debate about the discrimination of gays and lesbians in the Anglican Church. It seems that some in the local community found it offensive enough to deliberately rip off the cross from the meter, leaving the entire spectrum of gayness open for interpretation. Reverend Nelson says that they have been getting quite a few positive responses, which is unique for a country that normally does not talk about such issues seriously. It’s not part of our national character to make a lot of public statements, we tend to say ‘well that was interesting. But in this case there are a lot of people making very passionate and strong statements, saying it’s time for the church to change. And I’m delighted. Maybe we’ve reached a point of maturity in our culture where we’re willing to let go of these old fears and prejudices. Another reverend at the church, Reverend Cardy, had some very wise words for those who think that anti-gay discrimination does not affect them.